Money and Soul explores our troubled relationship with money, with finance, and with the economic system in which we are all entangled. It invites readers to consider how childhood experiences with money can shape attitudes, and how attention to individual conscience and shared Quaker values can illuminate big finance and economics questions that lie in the shadows, but cry out for more light. 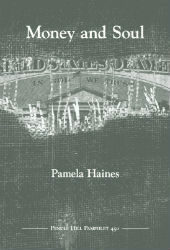 The pamphlet offers a brief sketch of how our political economy has shifted since the late 1970s from a concern for common welfare to a focus on private gain, and offers suggestions, using the framework of the testimonies, for ways that Friends can bring personal practices around money and personal witness around the economy into closer alignment with faith values. This is an invitation to those for whom finance and economics may seem like a closed book to find new openings for discernment and action. Discussion questions included. Pamela Haines is a member of Central Philadelphia Monthly Meeting and a longtime resident of Philadelphia. Her paid work includes supporting childcare workers through leadership development, community building, and organizing for policy change; teaching peer counseling; and leading family playgroups. She is active in Philadelphia Yearly Meeting’s Eco-Justice Collaborative, the Friends Economic Integrity Project, and the national interfaith group Faith, Ecology, Economy, Transformation. She has written a Pendle Hill pamphlet, Waging Peace: Discipline and Practice (PHP #420); co-authored a book, Toward a Right Relationship with Finance: Interest, Debt, Growth and Security; led workshops on faith and economics; and spoken on the topic of climate, justice, and racism. She is on the board of Mill Creek Urban Farm in West Philadelphia and is active with the Philadelphia Orchard Project and her community garden. She enjoys deep personal connections in Poland and Nicaragua and has helped develop community building and trauma healing work in Uganda and Indonesia. She is a mother and grandmother, is passionate about quilting and repair of all kinds, and blogs at www.pamelalivinginthisworld.blogspot.com. This pamphlet grew out of a plenary talk at Intermountain Yearly Meeting in 2017 titled “Money, Integrity, and Community.” The text of that talk was published by the Western Friend (westernfriend.org) and the portions used in this pamphlet are reprinted with permission.